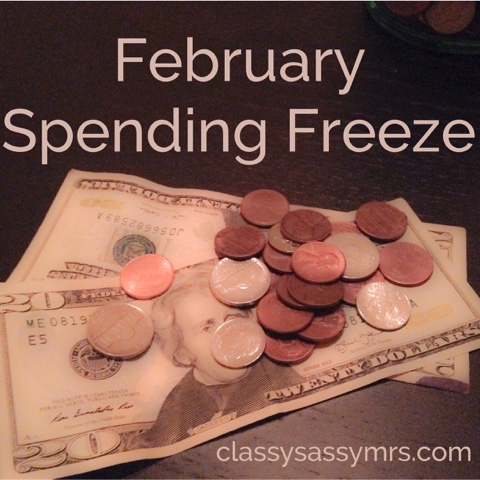 We have made it through No Spend February. Barely. Was it a perfect month? Not in the slightest. Did we cut back our spending from previous months? Definitely. Now, for the money spent words of shame. Powerball Tickets-Silly? Yup. But when your office has an office pool and you would be the only one saying no, you lose willpower. Flowers-Brian forego the spending rule to be a super sweet husband on Valentine's Day. Not a total loss..
Wine-Turns out, giving up wine isn't quite as easy as I had hoped. Eating Out-Brian did grab a few lunches this month at McDonalds, grocery store, etc. Each time I felt the need to remind him of our freeze ;) We also did end up grabbing Chik Fil A this past Saturday. But technically, was it even still February then? Netflix/Redbox-Giving up Netflix wasn't even thought about. One of the expenses we didn't even consider an expense. This is a good example of why we needed this month to analyze our finances. Groceries-We can't go without food but we did realize how much we actually spend on groceries. It's the average of a family of 4. Seeing as we are not one, we need to now figure out how we can fix this. Target Run-After 3 months, I went back to Target to return a pair of shoes. Since I spent under the amount I had just returned, I do not count this as a cost. Plus, my purchases included cat food, chili beans, upholstery cleaner and chicken. Nothing fun there, folks. Even though this month wasn't the complete freeze that we wanted it to be, I know I have adjusted my habits. I realize how much useless stuff I spend money on. Amazon is my weakness. Especially with Prime. As mentioned, we did see how much we actually spend on groceries. This month we did much better than January & December, which shows meal planning does have its benefits. There is a still a lot we need to do so we can save on groceries. This means figuring out a few meatless meals and utilizing coupons when necessary. Overall, I am still glad that we did this the past month. We had a few slip ups, yes, but we realized how much we could be saving by planning ahead and making a budget for the things we just can't give up. Like wine and the occasional lunches. Have you guys tried doing the Ramsey cash system? It will work wonders on your spending. I do that, and was able to buy a car in cash with my husband after I totaled mine last week. Makes a HUGE difference and cuts out the fast food/Starbucks/Whole Foods/Target runs. Sounds like you guys did awesome! I envy your willpower. I would not be able to do that - especially the Target part! That is still an A+ in my book! We don't spend too much money, but I do always analyze our money! I think it helps a lot knowing where you are spending your money!! I bet your glad that this month is over!! I have read a lot about it and we started it but I think we didn't know how to plan right. And when we felt like we couldn't do it, we stopped. Maybe we will give it another try! We do eat a good amount of produce and meals at home so maybe that's it. And you're right if it's healthy I guess I shouldn't be so worried! It was definitely hard. For me, Amazon was the hardest. I tend to just buy because I have Prime without realizing what I'm spending. Bad habit! I am so glad it is over! But I am glad we did it so we realize how we are spending and why we are spending. The lunches out, the Amazon shopping, it all ads up.